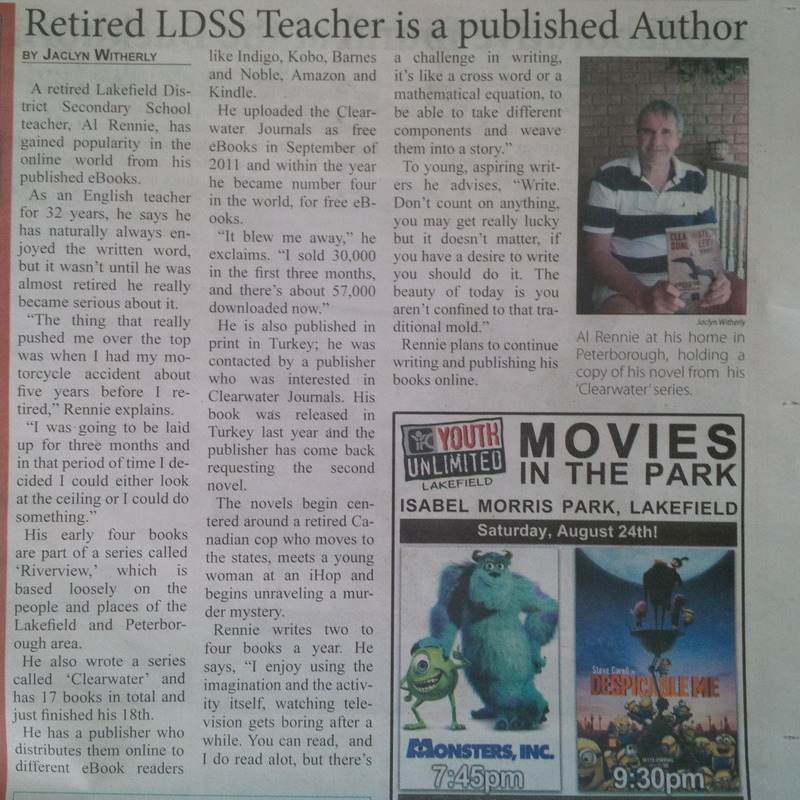 A retired Lakefield District Secondary School teacher, Al Rennie, has gained popularity in the online world from his published eBooks. As an English teacher for 32 years, he says he has naturally always enjoyed the written word, but it wasn’t until he was almost retired he really became serious about it. “The thing that really pushed me over the top was when I had my motorcycle accident about five years before I retired,” Rennie explains. His early four books are part of a series called ‘Riverview,’ which is based loosely on the people and places of the Lakefield and Peterborough area. He also wrote a series called ‘Clearwater’ and has 17 books in total and just finished his 18th. He has a publisher who distributes them online to different eBook readers like Indigo, Kobo, Barnes and Noble, Amazon and Kindle. He uploaded the Clearwater Journals as free eBooks in September of 2011 and within the year he became number four in the world, for free eBooks. He is also published in print in Turkey; he was contacted by a publisher who was interested in Clearwater Journals. His book was released in Turkey last year and the publisher has come back requesting the second novel. The novels begin centered around a retired Canadian cop who moves to the states, meets a young woman at an iHop and begins unraveling a murder mystery. Rennie plans to continue writing and publishing his books online.